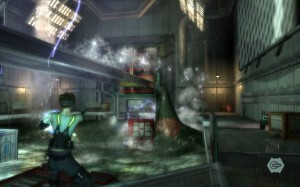 Hydrophobia was initially released on Xbox Live Arcade last year to terrible reviews and middling success. So the team went back and fixed a lot of bugs, updated the textures and effects, fixed some of the cut-scenes and even re-recorded the voice over for the character’s sidekick with a new voice actor. They named this new version Hydrophobia: Prophecy. The biggest change they made was making a PC build of the game and approaching Steam. I say this because I would not have played this game otherwise, it was on a Steam sale day (it’s normally only about $10 anyway) and I heard it had a really good water physics simulator, so I picked it up just to see how good. I was really surprised by how much I liked it, and continued playing it past the initial view of water, fire, and normal physics. What is really surprising is that I played 5 or the 6 hours of this game (it’s really only that long, but it was an arcade title, and I paid $5 for it) on my crappy work computer. 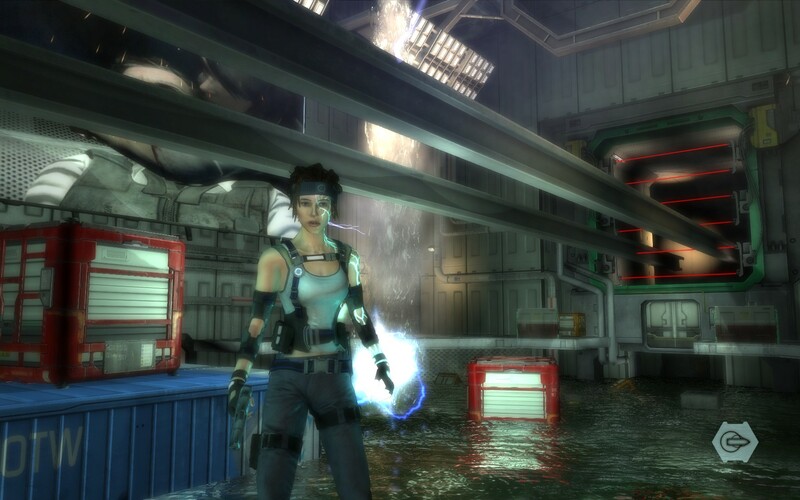 I actually had to turn all the graphics down and it still chugged heavily at times, especially with lots of water physics or particle physics like steam, dust, or water spray. Even with all this working against it, I soldiered through on my lunch break for 5 days because the game is actually quite enjoyable. The story is fairly unique; The world is overpopulated in the near future (that’s a certainty) and the governing body of the world has taken to living on a very large ship which floats in the ocean somewhere. A terrorist group infiltrates the ship and starts to blow it up and kill everyone on board, which ultimately leads to lots of broken platforms and stairways and lots of flooded compartments and water everywhere. This simple story explains all parts of the game perfectly, so that you never stop and think “well isn’t that weird that some ancient civilization made it only possible to traverse up this tower via flag poles and mislead bricks”. The story is told in three acts, like any contemporary play or movie and really helps with the pacing. The first act you start in your room and you go about your day, which gets you accustomed to the moving of your character which takes a little getting used to and could be a little better. Eventually you learn to use your “Mavi” which is a cool roll-up computer with a transparent screen for augmented reality enhancements. With the Mavi you learn that you can see writing on the wall that isn’t there physically, you can open doors and hack video cameras. When all hell breaks lose, you actually play for a while without a weapon, just trying to traverse broken parts of the ship and avoid fire and explosions. You have a companion who speaks to you through an earpiece and helps because he’s locked in another part of the ship and can see you on the video feed. This is great progression because it doesn’t throw a lot of things at you at once. You are mainly just trying to find a way out of the section you are in so you can save yourself. Act two starts around the time you realize that the terrorists want to destroy all life on earth using some nanobots the company you work for makes and you decide you should stop them. Around this time you find a gun that only shoots stun rounds but if you charge it up you can cut electrical wires or explode barrels of oil, or knock a guy out so he falls in the water and drowns. Because shooting draws attention from the terrorists, it’s best to find ways to ambush them and use the environment to finish them off quickly, such as getting them to walk by an oil barrel or someplace you can drop an electrical wire on them. Later you find different ammo for your gun including regular bullets, but that’s boring so only use them as a last resort, in my opinion. Act three starts when you accidentally get infected with some of the nanobots that the terrorists are trying to steal and need to find drugs to counteract the effect and keep you alive. All the while tracking down the leader of the terrorists so you can finish her off. This is where you eventually learn that the nanobots have given you the power to control water. You then have an additional ability to create a water column from the surrounding water which can lift people and obstacles and “throw” items that are in the column. So this of course leads to a giant boss battle, unfortunately my poor work rig just couldn’t handle everything going on and I couldn’t move quick enough, switch weapons quick enough or even see what was going on well enough to play effectively. When I got home I spent 1.5 hours downloading the game at home so I could play about 15 minutes of the final boss fight and beat the game. I didn’t know it was that close, I thought I’d just get past that boss fight and I could continue on at work tomorrow. One huge benefit of doing this was that I could turn up all the graphics to their peak and the game ran beautifully smooth and looked great at the same time. If I had one regret was that I should have played this from the start at home. All my screenshots are from my home computer with all the graphics turned up to max. 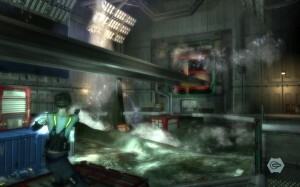 One really interesting thing about using a dedicated water physics engine is that they were able to create a room with a little water in the base, then have a pipe burst and slowly flood the area with water which you can then swim in and watch barrels get pushed around by waves and have those waves crash into walls and come back from the wall. It all seemed great and obviously the best water I’ve seen in any game, though not perfect it’s the shape of games to come I hope. I don’t know how bad the original voice work for the protagonist’s sidekick was, but the new one they put in this game was really quite funny. There are a few cultural references that you don’t really expect and gave me a good chuckle. When all is said and done, I’m actually really glad I played this game and quite enjoyed it. As with everything I enjoy I’m never really sure if I enjoy it more from having lowered expectations in the first place, or not. Either way, for $10 (or during another Steam deal for $5) you really can’t knock it.